ALBANY, N.Y. -- Troy native, Scott VanDerveer said, "It feels like I've known for a long time that I was called to be a priest." Surrounded by family and friends, "I'm here to support Scott. He's a wonderful, charismatic human being who will bring his giftedness to this Diocese," Mary Theresa Streck said. In the presence of dozens of priests, deacons and two bishops, Scott VanDerveer begins his journey Saturday, into priesthood. VanDerveer said, "I think in today's world, priests are more than just religious figures. I think they are figures of hope." And it is that hope that has a Call to Action Witness group gathered across the street from the Immaculate Conception Cathedral in Albany. Streck explained, "We really feel that women should be allowed to be ordained in the Catholic Church...Call to Action Albany Leader, Steve Powers said, "The role of women in the Catholic Church has literally been erased over the centuries. We are hoping to reverse that trend." But according to Father Kenneth Doyle, of the Albany Diocese "There is no tradition for women priests in the Catholic Church. Women play other prominent roles in the church, but have never been ordained to the priesthood." "I do know, it’s the right step for me and it feels very much a calling that I should be following and I need to take," Streck said. Scott VanDerveer will conduct his first mass as a priest Saturday evening at the Church of St. Vincent de Paul. Father Kenneth Doyle's comment contradicts a twelve hundred year tradition of women's ordination in the church's history. (See Gary Macy, The Hidden History of Women's Ordination and Ute Eisen,Women Office Holders in Early Christianity. I think all diocesan spokespeople should read these books and study the archaeological evidence of theologians like Dr. Dorothy Irvin that depicts women deacons, priests and bishops in the early church. They could read the papal bull written by Pope Gelasius, in 494 AD. ( no kidding, that's the correct name!) In this decree the pope ordered the bishops in southern Italy to stop allowing women to preside at Eucharist. In 1976, the Vatican's own scholars, the Pontifical Biblical Commission's concluded that there is nothing in the Bible that would prohibit women's ordination. We look forward to Mary Theresa's ordination and appreciate the support expressed by so many Catholics in the Diocese of Albany. I really like the sign "God knows her calling is as valid as his calling"
The Association of Roman Catholic Women Priests' mission is a renewed priestly ministry in a community of equals. Our orders are valid because a male bishop in apostolic succession ordained our first women bishops. www.arcwp.org The full equality of women in the church is the will of God in our time. "Not so Fast, Vatican Contradicts Comment by Pope Francis that Atheists Can Go to Heaven"/Score one for the Pope! My mother Debra is an incredible women, she's an established author and exceedingly educated scholar, a caring and loving mother and wife, a friend, a mentor, a minister, and a rock of limitless wisdom and guidance to so many. She is an extraordinarily strong woman and has always had an unwavering ironclad commitment to fairness and equality, for doing the right thing, treating people the right way, and simply being a good person every single day. But if I were to describe her as one thing above all else, it would undoubtedly be selfless. My mother is the most selfless human being I have ever met in my entire life -- almost to a baffling degree. My mother will sacrifice her money, time, comfort and anything else it takes to save someone, help someone, make someone’s life just a little bit better. She's literally done this her entire life. My mother has spent every day of her existence serving the needs of others--as a sister, a mom, an Aunt, a teacher, a minister, a volunteer, and as an endlessly charitable individual. The most fascinating thing about my mothers selfless commitment to others is that at numerous times throughout her life, starting at a very young age she has been harmed and hurt by people who were suppose to love her, care for her, and protect her. And yet she has never let these betrayals change her for the worse, she has grown from them, risen up from them, and become a better person from them. She has never, not even once let these wrong doings corrupt her soul or deter her from god’s path. Instead she's used these experiences to make her self better at loving others, caring for others, and to protect others from these types of things happening to them. As the second oldest of 7 she spent her childhood as the primary caregiver for most of her brothers and sisters. Later she was only in her 20's when she began fostering orphans. A few years after that my sister Courtney and I were born and shortly after that my cousin Jess. And my mom spent every day putting her children and her nieces FIRST, sacrificing decades of her life, her own needs, happiness, and wants to give us the best childhood she possibly could. Once her paternal duties had been fulfilled and my sister and I grew up and went off to college, when most people would have seized the opportunity to find personal enjoyment, she instead chose a different path. She chose to start a difficult journey a journey to fulfill her destiny, to do what she was put here on this earth to do-- to use her incredible intelligence and education, her talents, her skills, her lovingness, her compassion, and her eternal selflessness to serve God. My mothers work spans the spectrum from simple acts of kindness like always buying extra food at the grocery store to make sure she never goes empty handed to the food collection at church on Sundays to the monumental crusade of helping and sometimes even saving young impoverished single mothers and their children. My mother’s heart and soul is kind and pure, in 27 years I have never seen a single ounce of hate, prejudice, injustice, or cruelty, not one time, not for one single second. She is all-inclusive, all loving, all caring, and all protecting of those who need it. I'd like to share a brief story with you before I finish I think it is very telling of the type of individual my mother is. A few years ago at the end of college I hadn't been to her house for Thanksgiving for quite some time. My father lives in Florida and normally I go to his house for Thanksgiving and my Mothers for Christmas, but this particular year I decided to go to my moms for thanksgiving. On thanksgiving morning I woke up and came upstairs to find tables and chairs everywhere; the dining room table extended to its max and surrounded with as many chairs as you could fit, fold out tables over taking her office the hallway. The house was set for dozens of people. Puzzled, as we have no family per say in Ohio, I asked my mom who was coming over? And she proceeded to say well we have about 5 or 6 people from church who have no where to go for thanksgiving, and our neighbors don't have any family to go to, and neither do their friends, and their friends kids don't have anywhere to go and this guys cousin and someone else's niece and even the guy who mows our lawn has no where to go tonight. So they're all coming here. This is the type of person my mother is, always caring for others, always concerned for others, always inviting others into her home, her heart, and her arms in order to make their lives just a little bit better. I can not imagine a Person, Man or Women, who is more qualified both in their accomplishments, in their heart and in their soul to enter the priesthood. There is no question in my mind that my mother’s entire life has been training for this moment and for what lies ahead. It is such an honor to be here, and I am so proud of you mom, I love you so much and I'm so glad that you have finally found your way to your true calling. Mom I want to commend you, and all of you here today for that matter for what you are doing, for standing up for what you believe in, for having the will to fight back against an injustice and the strength to see it through. What you are doing here today is a historic moment, not just today but what this organization has been doing for some time it's historic. This is how you change the world, it starts with small groups of people in small rooms fighting for what they believe in, for what they know to be right, a group of people who aren't afraid to stand up and be the change they seek in this world. One day, maybe in a few years maybe in a 100, but one day people will look back on this room, and the others like it and they will say this is where it started, this is how it happened, these were the pioneers, these were the Women who corrected this injustice, these were the ones who laid the path for what is sure to be a long line of Women Catholic Priests. It’s not always easy to make this type of change, but when you are on the right side of history, history will eventually be on your side. 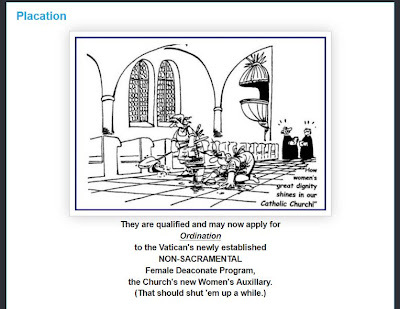 Women Deacons Coming Soon to Roman Catholic Church/ "Placation" Cartoon by John Chuchman/A Step Forward or Backward? A non-sacramental, female deacon makes no sense! Also known as "the new women's auxilary"
The full equality of women in th church is the voice of God in out times. As Roman Catholic Women Priests, we are often asked, “Who will take care of my burial? 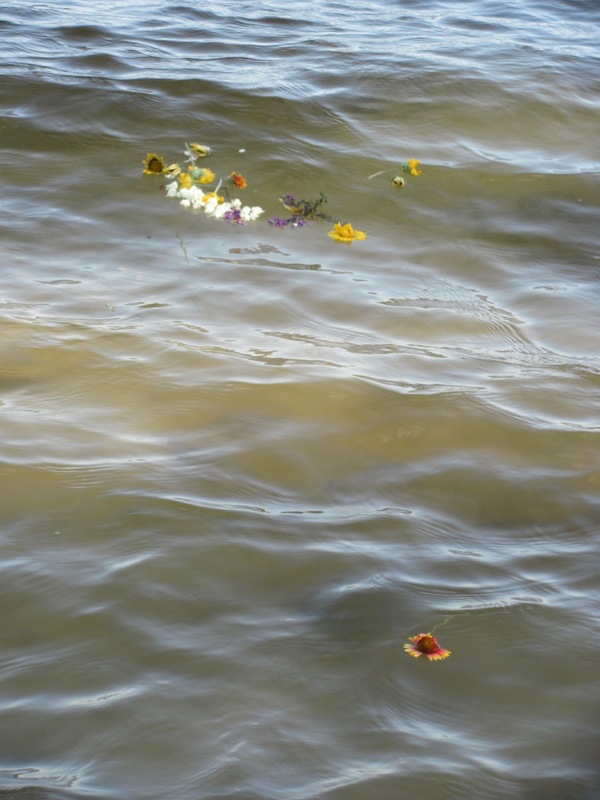 What will it look like?” We meet the needs of the grieving family and friends in planning a ritual that brings comfort and peace. As an example we would like to share the Commitment ritual for Pauline called Neemie by her friends. Katy Zatsick ARCWP met with Kevin and his wife Judy to plan the service. On Saturday May 25 members of Mary Mother of Jesus held a memorial service for Neemie after the scheduled Saturday liturgy. Memories of Neemie’s generosity to all and her dedication to the success of her employer’s company were recalled with tears by her fellow employees. ﻿It was a blessed time for all who for the first time heard the stories of how Neemie made a difference in the lives of those in her circles. We felt honored to be part of the planning and to experience the beautiful sharing in and prayers of Neemie’s memorial. On Sunday, June 2 2013 members of Mary Mother of Jesus and co-workers gathered at the home of Lee and Carol Ann, married priest partners. 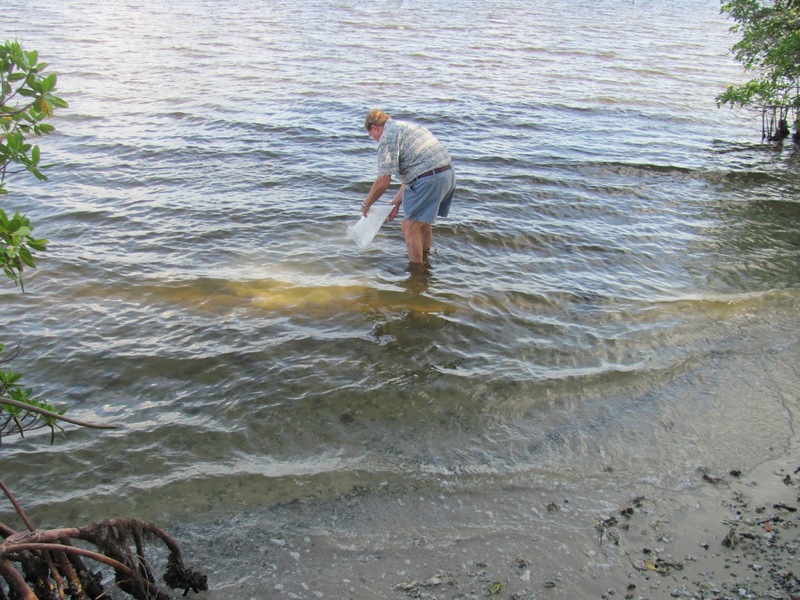 We were at Mercy-on-the-Manatee nature preserve to spread the cremains of Neemie in the Manatee River. Kevin welcomed us on the deck overlooking the Manatee River. Mango trees opened up a space to give us access to the flowing river. It had threatened rain but the clouds broke and the winds blew the water gently at our feet. We sang Holy Ground. ”We are standing on Holy Ground because God is present. And where God is, is holy.” We prayed a final blessing for Neemie. 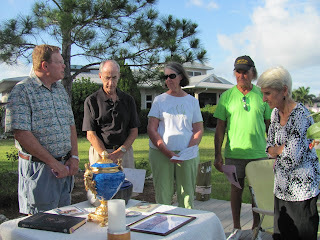 Kevin removed the ashes from the beautiful urn he had provided and we gathered at water’s edge. 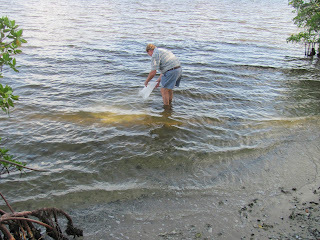 Kevin walked into the river and released Neemie’s cremains. 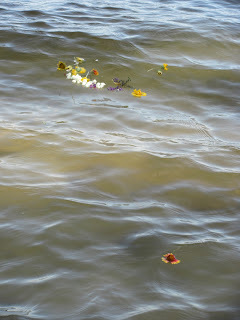 Each of us took a fresh flower of remembrance and placed it into the river to accompany Neemie to the gulf and beyond. We retired to a local restaurant for a meal shared in Neemie’s honor. I was a hospice chaplain for seven years and presided at many memorials. This time I experienced God’s compassion as Neemie had no one to remember her. Neemie’s employer, her co-workers and members of Mary Mother of Jesus provided her a beautiful service. Neemie joins the Communion of Saints from which she will greet us when we see her in our eternal home. Co-Pastor of Mary Mother of Jesus Inclusive Catholic Community, Sarasota, Fl. ..."Jesus appreciated the humor in the human condition. When Peter tried to walk on water like Jesus did but sunk like a crosier, you can imagine Jesus and the others laughing as they pulled their soaked friend back into the boat. When Jesus raised Lazarus from the dead, you can see Lazarus and Jesus with him, hugging and laughing until they cried. And when Jesus rose from the dead and met two friends who didn't recognize him, he said, "Let's eat!" They recognized him only in the breaking of bread. Can you imagine how heartily Jesus laughed? Jesus was the Son of God and never took himself seriously. We spend our whole lives taking ourselves seriously, trying to do everything ourselves, trying to be somebody, climbing ladders to get ahead. Sooner or later we discover that the human joke is on us, that the life we've spent decades making up, grand or meager, is a sham and we want to scream. We've got to see the mock in the soap operas we make or go insane. A Course in Miracles tells us: "Into eternity, where all is one, there crept a tiny, mad idea, at which the son of God remembered not to laugh." We are all the sons and daughters of God. The "tiny, mad idea" is that we are not, that we are separate from God and from each other. Jesus came to teach us that we are not human beings trying to be spiritual but spiritual beings pretending to be human. Therein lays the madness, and the pain. The next time you can't stand it anymore and want to stop the world and get off, go do something stupid with a friend and laugh. Or better yet, sit in stillness under the stars. The human condition is just a phase you're going through -- you'll get over it." "A stark contrast to the actions of members of the US hierarchy lately, Pope Francis is preaching a gospel of tolerance from the Vatican leaving many commentators and Catholics wondering what implications this will have. Whereas Cardinal Timothy Dolan of New York is quite literally closing the cathedral doors to LGBT Catholics and failing their pastoral needs, the pope is demanding that every church’s doors be open wide to anyone who seeks Jesus Christ. Winters (from National Catholic Reporter) writes that Pope Francis "questions prelates like Archbishop Charles Chaput who exclude a child from Catholic elementary school for having lesbian mothers. He notes the false torment of Catholic parishes and dioceses around the recent Boy Scouts of America decision to allow gay youth. Ultimately, he concludes that the pope’s message should change this dynamic by making clergy more about love than rules. In loving and inviting all who seek our Catholic community, Pope Francis provides an alternative to the standard policy of exclusion found in too many parishes and dioceses. He claims Jesus is “indignant” when Catholics cannot access the sacramental life of the Church, the opposite of what Detroit Archbishop Vigneron said when he told told Catholics who support marriage equality to stay away from communion. The pope is preaching words of welcome, just as many are asking, “Can LGBT Catholics find a home in the Church?” This question can be answered positively if bishops around the world are listening to Rome, and on this matter, we must hope they are." 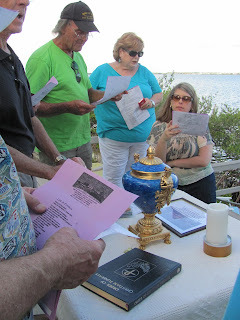 On Pentecost our Good Shepherd Community in Fort Myers had a wonderful time of celebration. We celebrated the Spirit of God within us and the birthday of the Church with much joy and expectation of renewal. We also celebrated Grandma Harmon's birthday. This wonderful woman has brought a daughter and sixteen of her grand children ranging in ages from 2/12 to 22 to our church. In turn they have brought their friends and so the spirit spreads like wildfire. She has had many trials and many joys in life. This day was full of joy for her. We focused on what one woman could do when she had faith. We also celebrated the High School graduation of Maria and the grade school graduation of Marcella. Their mother Lili works very hard and was so proud of her children, especially Maria who has had many troubles. Here we share our joy with you. ARCWP Priests and Good Shepherd Co-Pastors Judy Beaumont and Judy Lee host Documentary: "Pink Smoke Over the Vatican"
hosted a showing of the thought provoking documentary Pink Smoke Over The Vatican sponsored by the All Faiths Universalist Unitarian Church in Fort Myers. The Women's Ordination Conference is thrilled to announce Fr. Helmut Schüller, founder of the Austrian Priests' Initiative, a movement organized in 2006 to address an increasing shortage of priests, will be on a 15 city, national speaking tour this summer. 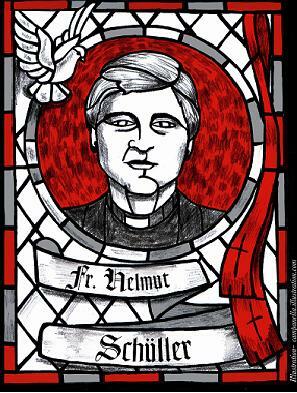 His "Call to Disobedience" signed by a majority of Austrian priests, has brought worldwide attention and momentum to addressing the crises in the Catholic Church. Today, he leads a practical movement that recognizes the Holy Spirit among the laity and calls for inclusive and transparent changes to Church governance, including women, LGBT persons, and married priests. ..."Jesus, however, was not a priest. He was a Jewish layman. He did not belong to the Levitical tribe of priests. He never offered sacrifices in the Temple and in fact he was critical of a corrupt priesthood of his time. What he did do was eat meals with all kinds of people — with his family and friends, strangers, misfit disciples and social outcasts. In doing so he embodied what he stood for — treat all people equally and eradicate injustice. We memorialize his actions whenever we gather to celebrate the eucharist, which, we believe is a foretaste of the heavenly banquet. In the post New Testament period the leader of the community was accepted as the presider of the eucharist. Later, only bishops who were the overseers in communities, and then other elders called priests, assumed the authority to preside at the eucharist. By the mid second century the liturgy was believed to be a sacrificial act. Ordained men continued to preside in the person of Christ. The laity were no longer involved in various ministries according to their gifts. They became spectators which was, in part, what paved the way for adoring the sacrament they were no longer sharing. .. The eucharist is not just about the transformation of bread and wine into the body and blood of Jesus Christ, which we believe. It is also about our transformation. The mystery of faith is found in the church. We are called to share our resources, even giving up our own assets and supplies, so others can share in the favors, the graces, the gifts of God. Mary Theresa Streck has lived a life according to the principles of her Roman Catholic faith. 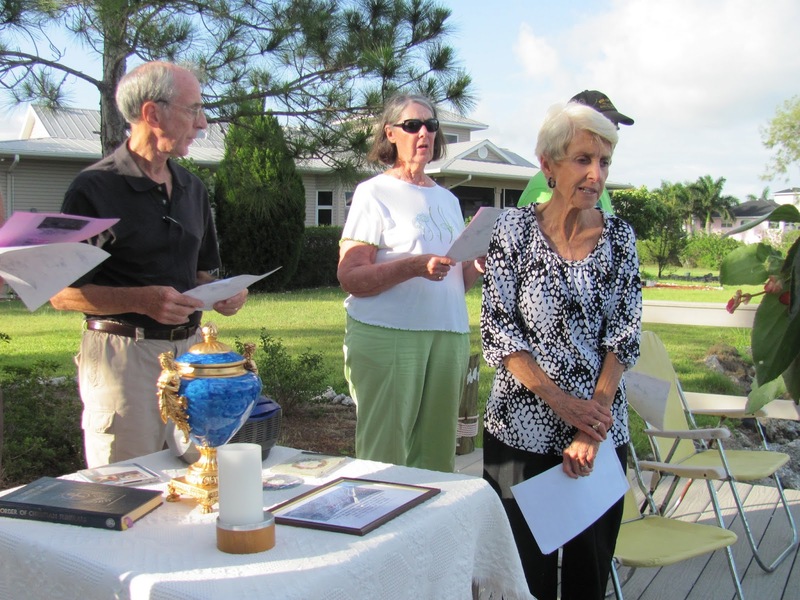 For 18 years, she was nun in the order of Sisters of St. Joseph. While living in the Taylor Apartments in Troy, ministering to its low-income residents, she asked to be let out of her vows to marry Jay Murnane, who was released from his service as a priest. Together, they continued their ministry for 20 years, still guided by faith to run the Ark, an after-school art program there, and to launch the Ark Community Charter School in Troy to continue to work with children struggling with issues caused by poverty. Though it is a public school where religion cannot be taught, Streck said, it is guided by her principles. Widowed nine years ago, and now at 65 looking to wind down her education career, Streck still feels pulled by faith. This time, the step she is about to take may cause her to be excommunicated from the church she loves: This fall, she will join a group of women who say they have been legitimately ordained Roman Catholic priests. "This is a continuation of a lifetime path," she said. "It's not like I woke up and said 'Now I'd like to pursue a life of ministry.'" On June 22, Streck will travel to Falls Church, Va., to be ordained a deacon by the Association of Roman Catholic Women Priests. She will follow that step this fall by being ordained a priest by Bishop Bridget Mary Meehan in Albany. "The movement started in 2002 with seven women being ordained," said Meehan, who is based in Florida. Now there are more than 150 in the United States, Europe, Canada and South America. While the Vatican says only men can be priests, the association claims its ordinations are valid. The first group of female bishops, they say, were ordained by a Roman Catholic bishop. Meehan said his name will be revealed upon his death. "The ordinations are valid but they are against canon law," Meehan said. Some priests who have publicly advocated ordaining women have been removed from their posts. Roy Bourgeois was expelled from the priesthood last year for attending Janice Sevre-Duszynska's 2008 ordination in Lexington, Ky.
Streck attends St. Vincent DePaul Church in Albany, where a female administrator serves as parish life director and fills all the roles of pastor except performing sacraments. Other women feel called to the priesthood, Streck said, but she is positioned to take the step. "I am not going to lose my pension if I do this. I am not going to lose my job to do this," she said. "For me, it's a joyous passage." The Rev. Kenneth Doyle, chancellor for public information for the Albany diocese, said women play valuable roles in the church but are not recognized as priests. 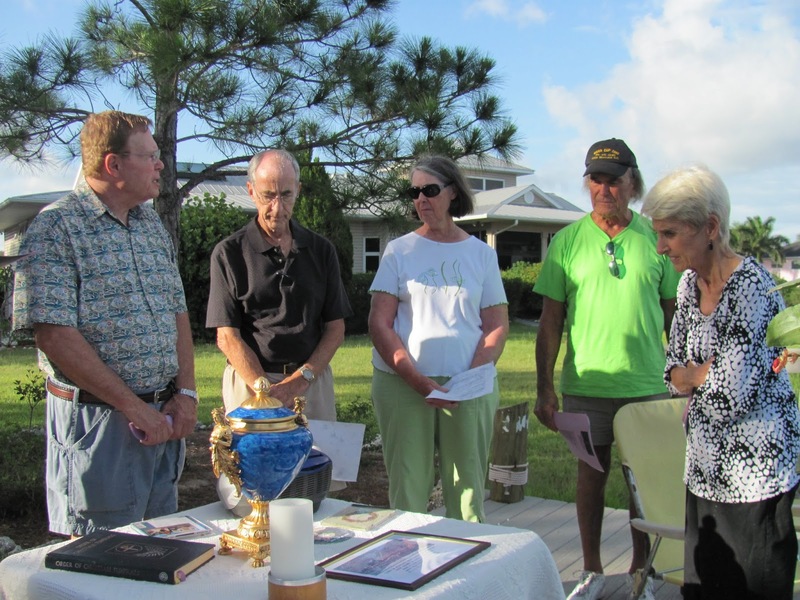 Some two dozen women are running parishes as parish life directors, he said. "There is no tradition for women priests in the Catholic Church. As popes have regularly stated, there is no theological basis for a woman to be ordained a priest," he said. "Women play other prominent roles in the church but have never been ordained to the priesthood." Meehan argues there is no theological basis for barring women from the priesthood, and they were ordained in the church's earliest years. She said Mary Magdelene, the first person to see the risen Jesus Christ, was long viewed as the "apostle to the apostles." Junia, a woman in the Bible's Book of Romans, is also referred to as "outstanding among the apostles." The church considers a woman who accepts ordination as having excommunicated herself, Doyle said. While the person is not supposed to take communion, he said, it is unlikely a priest or eucharistic minister would withhold it. Since their ordinations are not recognized, women cannot say Mass in Catholic churches. Instead, some hold services in other churches' buildings, while some say Mass in their own homes as Streck intends to do in her house in Menands. Steve Powers leads the upstate chapter of Call to Action, a group of Catholics that supports allowing women to become priests. The organization will lead a "witness for women" at 10 a.m. Saturday, June 8, outside the Cathedral of the Immaculate Conception during the ordination of a new Catholic priest. They support the man being ordained but advocate allowing women to become priests too. "We are just thrilled Mary Theresa has started to go on this path," Powers said. "Catholics are looking for spiritual leadership, and these women are providing it." Why not seek to change the church's view before accepting ordination? "I don't want to wait another 400 or 500 years," Streck said. "I don't put myself on a par with Rosa Parks, but if she hadn't sat down in the front of the bus, black people would still be sitting in the back. If suffragettes didn't fight for the right to vote, women probably wouldn't be able to vote. I've had people ask 'Why don't you become an Anglican priest?' And I say because I am not Anglican. I am a Roman Catholic."